This genus is accepted, and its native range is W. Central & E. Tropical Africa, Madagascar. Upper floret hermaphrodite; lemma firmly membranous or chartaceous, at length subcoriaceous, 5-nerved, clasping the palea, separated from the sterile lemmas by a thickened internode; palea similar, 3-nerved; stamens 6; stigmas 2. Perennial. Rhizomes absent (1), or short (2), or elongated (1). Culms erect (2/2); 30-65.31-100 cm long. Leaf-sheath auricles absent (3), or erect (1). Ligule an eciliate membrane. Leaf-blade base with a false petiole. Leaf-blades lanceolate (3), or elliptic (2). Leaf-blade venation without cross veins (2), or with distinct cross veins (2). Inflorescence a panicle. Panicle open. Spikelets solitary. Fertile spikelets pedicelled. Pedicels filiform (3/3); tip cupuliform (2/2). 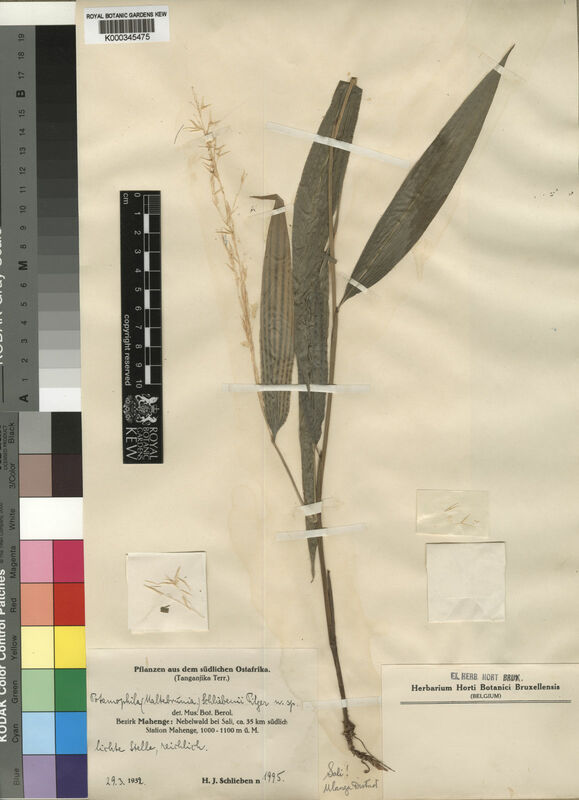 Spikelets comprising 2 basal sterile florets; 1 fertile florets; without rhachilla extension (2/2). 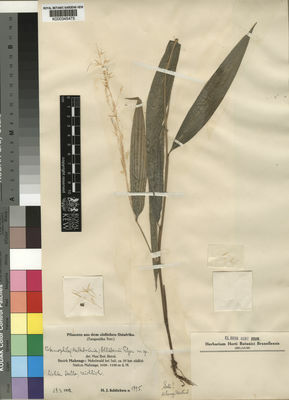 Spikelets lanceolate; laterally compressed; 3.735-6.914-10 mm long; falling entire. Rhachilla internodes brief up to lowest fertile floret (2), or elongated below proximal fertile floret (2). Basal sterile florets barren; without significant palea. Lemma of lower sterile floret subulate (3), or linear (1); chartaceous (1/1); acuminate (1/1). Fertile lemma elliptic (2), or ovate (3); lanceolate in profile (1/1); membranous (1), or chartaceous (3); keeled (2/2); 5 -veined (3/3). Lemma lateral veins without ribs (2), or ribbed (2). Lemma surface glabrous (3), or pubescent (1). Lemma margins flat (2), or involute (2). Lemma apex acute (1/2), or acuminate (1/2). Palea 1 length of lemma; membranous (3), or chartaceous (1); 3 -veined (2/2); 1-keeled (2), or 2-keeled (2). Palea surface glabrous (3), or pubescent (1). Lodicules 2 (3/3); membranous (2/2); acute (2/2). Anthers 6. Stigmas 2 (2/2).